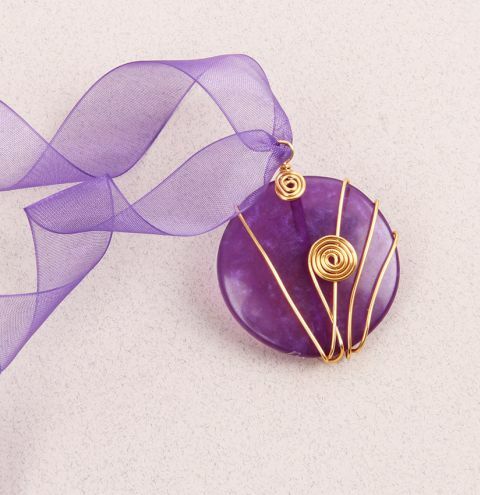 Learn how to make a colourful wire wrapped pendant with a bright handcrafted resin style bead. Cut a length of wire measuring approx 12" long. Thread one end up through the bead and make a wrapped loop, leaving a 2" length of wire. Take your round nose pliers and make a small loop on the end of this. Then take your flat nose pliers and gently curl this loop in on itself to make a coil at the base of the wire wrapped loop. Take the bottom length of wire exiting the bead and wrap it as many times as you want around the bead. Once you are happy with your design, leaving a 3-4" length of wire, create another tiny loop at the end and make another coil out of this wire. Position it on the front of your design. Finally, take a length of your ribbon and thread it through your loop. Cut your ribbon to the desired length. Tie the ribbon in a bow at the back and wear!